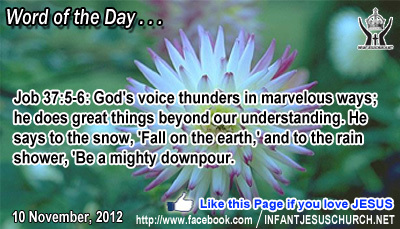 Job 37:5-6: God's voice thunders in marvelous ways; he does great things beyond our understanding. He says to the snow, 'Fall on the earth,' and to the rain shower, 'Be a mighty downpour. Heavenly Father, and Eternal God! You alone are truly holy. We cannot but understand the distant outskirts of your ways, but we love you. You are so far beyond us on our best days, we can't quite understand why you would pay such a cost to save us. But, Dear Lord, we thank you and praise you from the bottom of our heart. In Infant Jesus' name. Amen. 9 And I tell you, make friends for yourselves by means of unrighteous mammon, so that when it fails they may receive you into the eternal habitations. 10 "He who is faithful in a very little is faithful also in much; and he who is dishonest in a very little is dishonest also in much. 11 If then you have not been faithful in the unrighteous mammon, who will entrust to you the true riches? 12 And if you have not been faithful in that which is another's, who will give you that which is your own? 13 No servant can serve two masters; for either he will hate the one and love the other, or he will be devoted to the one and despise the other. You cannot serve God and mammon." 14 The Pharisees, who were lovers of money, heard all this, and they scoffed at him. 15 But he said to them, "You are those who justify yourselves before men, but God knows your hearts; for what is exalted among men is an abomination in the sight of God. God loves each one of us generosity and he gives openhandedly and liberally to those who share his gifts with others. The Pharisees, however, had no space in their hearts for God. The gospel of today says they were lovers of wealth. Love of money and wealth throng out love of God and love of national. Jesus makes clear that our heart should either be possessed by God's love or our heart will be overcome by the love of something else. What does our heart most treasure? Loving Infant Jesus, may the fire of your love burn in our heart that we may be completely devoted to you above all else. Free us from greediness and attachment to material things that we may be kind in using the gifts and resources you give us for your glory and for the better of our neighbor.